It’s common knowledge: CFA Institute puts emphasis on Ethics. 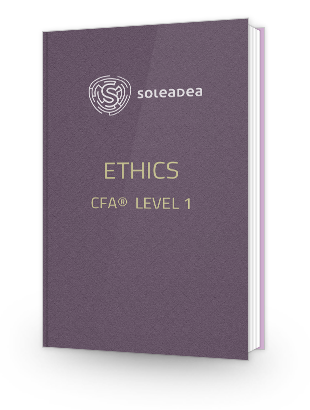 What it means is that your Ethics score may effectively influence your final CFA exam result. And it’s true for every exam level. What Is CFA Ethics Adjustment? Ethics adjustment may have either a positive or a negative impact on your exam: it makes you either PASS or FAIL if your total exam score borders the minimum passing score (MPS) set for your exam. What if we tried to use a more practical measure to illustrate the problem? Assume you’re a CFA level 1 candidate. There are 240 questions in the level 1 exam. We know that all questions are given equal importance. If each question is scored 1 point, we get the total of 240 points. MPS of 69% gives exactly 165,6 points. However, there are no half points in the exam because you either get a question wrong or right. If you happen to be a borderline candidate, Ethics adjustment works either in your favor or against you. Having this knowledge you can deliberately decide how to go about Ethics during your CFA exam prep. Our way is to take it seriously. That’s why in our CFA Study Planner we encourage you to begin and end your preparation with Ethics. To make sure it sinks in, you'll also have short review of ethical standards arranged in between other topics. Deal with Ethics our way (as scheduled inside your FREE study plan ) and score high in your exam Ethics questions! nor how it exactly works. You will never know if you were a borderline candidate or not, but it’s better to act as if you could be one. The net result is that the Ethics adjustment has had a positive effect on candidates’ scores, and exam pass rates, ever since it was introduced.